HMS Gaspee and her hated commander, Lt. William Dudingston, were sent by King George III to Rhode Island waters in March of 1772 to enforce the maritime trade laws and prevent smuggling. They made no friends amongst the colonists in harassing shipping and delaying, often unjustly, ships that had properly passed custom inspection in Newport. The latter was the case on June 9, 1772, when the packet sloop Hannah left Newport for Providence. When the Gaspee gave chase, Hannah's Captain Lindsey deliberately lured her across the shallows off Namquid Point (now Gaspee Point) and left the British ship hard aground on a sandbar, unable to move until the flood tide of the following day. Upon arrival in Providence, Captain Lindsey reported the event to John Brown, one of the most prominent and respected merchants in Rhode Island, who sent out a town crier inviting all interested parties to meet at Sabin's Tavern to plan the Gaspee's destruction. Under the leadership of Abraham Whipple, the small band of patriots rowed eight longboats with muffled oars to the stranded ship. Lt. Dudingston and his crew were taken prisoner and removed to Pawtuxet Village. 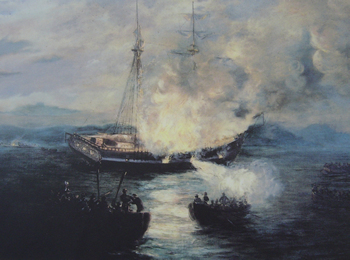 Near daylight on June 10th, the Rhode Islanders set fire to the Gaspee, burning her to the waterline whereupon her powder magazine exploded. Efforts of the Crown to learn the names of the culprits were unsuccessful, although a sizable reward had been offered. Public sentiment was in accord with the venture; this spirit of unity soon spread to the other colonies with the formation of the Committees of Correspondence to prevent further threats. It was but a short step from here to the First Continental Congress and eventually the Declaration of Independence.